What is the cut for radiologists? For the 90% of radiologists who qualify as EPs, a total of nearly $1.5 billion in incentive payments is available—if they take action now. The program employs a carrot-and-stick approach to drive compliance, with the maximum $39,000 incentive representing the carrot. The stick: Beginning in 2015, EPs who fail to attest to meaningful use will be subject to payment reductions. The reduction starts at 1% and increases each year that a Medicare EP does not demonstrate meaningful use, up to a maximum of 5%. A small percentage of radiologists see the program as an opportunity to advance their practice and use it as an early competitive advantage; they want to take advantage of the incentives to upgrade their technology. “The financial incentive encouraged us to get in, and we wanted to be the first ones in our area to attest to meaningful use. We are looking at promoting to referring physicians and patients the fact that we attested to meaningful use,” said Jennifer Staley, RT, Technical Director, Tri-City Radiology in Kenneweck, WA, where they attested using an EHR module provided by RamSoft. Nonetheless, most radiology practices have yet to embrace meaningful use, begging the question: Why not? With these new updates to Stage 2, many experts say it’s unwise to procrastinate, and that radiologists must take the time now to see how the changes affect their practices. Another cause for delay is the program gives radiologists who can show hardship a 5-year exemption from using EHRs to collect and communicate patient data. Yet there are no guarantees that the exemption will stay in effect. “Some radiologists close to retirement may take a hardship exemption (if eligible) to avoid Medicare penalties starting in 2015, and as Stage 3 comes along, some of the criteria may change, such as exemptions that may be even more favorable to specialty practitioners, such as radiologists,” noted Douglas Rufer, Director, Technical Marketing and Sales Engineering at Carestream Health. The consequences of not complying with the meaningful use requirements will still impact those radiology practices that deliberately choose not to participate. “They will still be affected,” said Keith Dreyer, DO, PhD, Vice Chair of Computing and Information Sciences in the Department of Radiology at Massachusetts General Hospital, Boston, MA, in an interview with the Daily Bulletin.5 “[Referring physicians] will use their certified EHR to order from us, and we will need to be able to serve them,” said Dr. Dreyer, noting that in Stage 2, referring physicians will have to fulfill requirements for ordering images and receiving results electronically. “It also takes radiologists off the road that the rest of health care is quickly moving down, so I would only consider this exemption if complying with the program is not an option,” he added. Implementing meaningful use and understanding how to use the EHR and the specific modules may take additional time, reported Ajay Bhatnagar, MD, MBA, a radiation oncologist practicing at Cancer Treatment Services Arizona Adjunct, and an Assistant Professor of Radiation Oncology, University of Pittsburgh School of Medicine. “You have to create patient-care visits, end-of-care summaries after they leave, and quality indicators. All of these requirements are typically outside of the doctors’ workflow,” said Dr. Bhatnagar. Ultimately, what has motivated early adopters is the belief that it’s better to reap the rewards today for what is inevitable tomorrow. “We thought we should do it while it is a bonus and might as well start participating now,” said Dr. Bhatnagar. With Stage 1, the gaps in existing radiology platforms relate mainly to data capture, including specific demographic information, medications, and vital signs. Some vendors have already extended their systems to support this workflow. With recent changes to CMS’ final rule for Stage 2 objectives, radiologists should look for gaps in their current system, as things get more complicated. 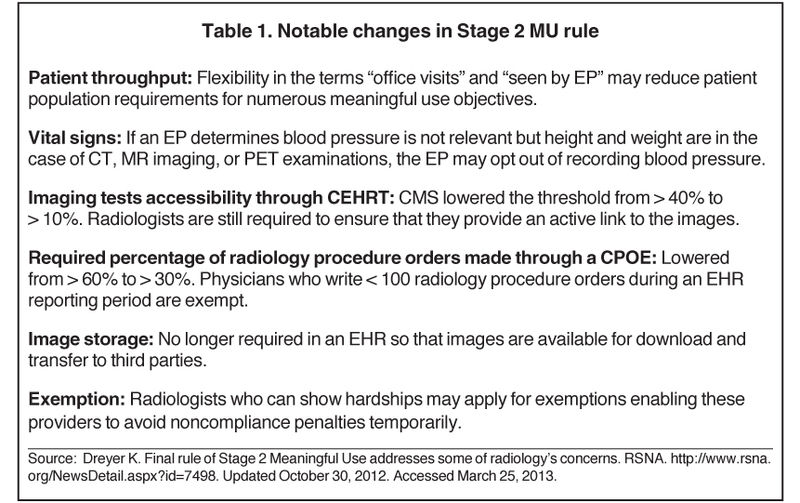 One change to the Stage 2 rule reduces the percentage of radiology procedures that must be ordered using a computerized provider order entry (CPOE) to 30% of the ordered radiology exams. In particular, the measures related to CPOE and the ability to view images in certified EHR technology will be critical factors to achieving compliance, and will be critical in maintaining the relationship between the hospital and imaging provider. “Stage 2 ups the ante for radiology specific applications in terms of meaningful use compliance, and having a solution designed with radiologists needs in mind will be critical,” noted Cooke. Radiologists will still have to address the issue of employing clinical decision support (CDS) when using CPOE. Although the Stage 2 rules do not include CDS in the definition of CPOE, radiology groups should still consider adopting CDS, since the American College of Radiology (ACR) continues to push for inclusion of CDS in Stage 3 requirements. At a higher level, radiologists need to maintain visibility through educating clinicians on appropriateness and quality. “Implementing CDS will add value to the care delivery process by reducing unnecessary costs and radiation exposure. Radiologists now have an opportunity to lead and shape policy through aggressively promoting the adoption of CDS as part of any shared-savings arrangement,” said Michael Mardini, founder and CEO, the National Decision Support Company (NDSC), the exclusive distributor of ACR Select. ACR Select represents an evidence-based national standards set of criteria developed by expert panels at the ACR and collaboration with over 20 medical specialty organizations. NDSC has integrated ACR Select with major EHR and CPOE vendors to make using CDS a seamless part of ordering workflow. The threshold for the imaging results accessibility objective was also lowered to requiring that just 10% of imaging tests be accessible through a certified EHR via an active link to the images. Yet radiology practices will still need to implement technology, such as XDS-I and XDR-I, or an image sharing platform to securely exchange the images. Another change to Stage 2 rules involves inputting vital signs into the EHR. If, for example, an EP determines blood pressure is not relevant, but height and weight are, common in CT, MR imaging or PET examinations, the EP may opt out of recording blood pressure. Education and training to address patient complaints about providing additional medical data. Radiology groups have a number of options to achieve meaningful use, and the number of options is growing. It does take some planning, but the incentives are worth it, and with the right help, achieving it can be a manageable task,” said Mardini. An EP must use an EHR or module that is certified specifically for the EHR Incentive Programs to make sure it offers the necessary technological capability, functionality, and security to help them meet the meaningful use criteria. In the past couple of years, the market has been inundated with certified image-enabled EHRs designed to support radiologists in achieving meaningful use standards, complete and modular certified RIS solutions, and other meaningful use modules, but there is no silver bullet. What EPs want to know is: What is the most efficient path to meeting meaningful use criteria? The first thing to know is every case is different. Radiologists need to consider their service model and referring relationships in relation to the available IT infrastructure in order to make the right decision about the best path to getting on the road to meaningful use. Radiologists who are part of an integrated delivery network can often utilize the hospital’s deployment of Ambulatory EHR to attest. It gets more complicated when you consider a large radiology practice that provides service to multiple locations. “Often, in the case of radiologists serving multiple hospitals, leveraging the hospital’s technology can be unwieldy,” said Cooke. A complete certified solution contains all the functions in a single place and automatically tracks, records, and reports on the achievement of the meaningful use objectives. “Most hospitals are concentrating on meeting the eligible hospital requirements for their overall organization, not specifically the ambulatory requirements that most radiologists fall under,” said Rufer. “Therefore, most hospitals will have a full EHR that will drive their priority for meaningful use compliance.” Moreover, the reimbursement for maintaining hospital compliance is higher than that for maintaining radiology compliance, noted Rufer. Radiologists can use a radiology information system (RIS) certified as an Ambulatory EHR, or a system that contains a certified EHR to comply with meaningful use. In radiology, these systems collect data and provide reporting specific to an EP, the department or practice (Figure 1). They can be used to augment the existing systems, or completely replace legacy, noncertified technology. One cloud-based meaningful use service that integrates with existing imaging IT solutions is ElementMU by ImagingElements. Based on a fully certified ambulatory EHR, the service is specific to the needs of radiology, and is designed to augment existing IT platforms. Using this solution, radiologists can participate in the meaningful use program without replacing technology or burdening the ordering health care system with extra work. The service is designed for radiologists who would not otherwise have access to certified technology, or for those that want to exploit denominator reduction opportunities by minimizing the set of exams in scope for meaningful use. “Using the ‘as seen by EP’ workflow reduction opportunities, we were able to use only 3% of our overall patient volume and still comply with the program,” said Frannie Joseph, Practice Administrator at Raleigh Radiology, a practice with several locations in North Carolina. Ramsoft offers a complete ambulatory EHR add on to its RIS solution. PowerServer 5.1 is 2011/2012 compliant, which means the software is capable of supporting providers with Stage 1 meaningful use measures. In fact, Tri-City Radiology is taking its reimbursement dollars from attesting to meaningful use to upgrade other electronic portals it shares with its clients. “We have had a lot of requests from clinics to create an HL7 interface with them, and with the reimbursement from meaningful use, we are putting that money toward implementing the HL7 interfaces with other clinics,” Staley added. “Now that meaningful use Stage 2 rules include image-enabling EHRs as a menu set measure, organizations like Huntington Hospital are looking to quickly and easily image-enable their enterprises for compliance,” said Jeff Surges, CEO, Merge Healthcare. Merge’s iConnect Enterprise Clinical Platform solution enables health care organizations to collect, archive, view, share, and exchange any type of image anywhere, any time. It includes iConnect Access, a zero-download DICOM image and XDS server, iConnect Share, a gateway for image sharing across the enterprise and iConnect Enterprise Archive, a vendor-neutral archive to create an enterprise imaging strategy. It works with existing applications, leveraging widely-used web and health care technology standards, to provide a vendor neutral interoperable environment. An example of a complete certified RIS system, Fujifilm’s Synapse RIS Version 6.1 is a fully certified EHR for radiologists to meet multiple criteria. Version 6.1 includes an enhanced dashboard that aids the user in managing performance in real time (Figure 3). Version 6.1 also includes Synapse Financials for RIS, which provides an option for incorporating the billing process into the system and a feature that alerts the user to dose management concerns for the patient. As with Fujifilm’s complete medical informatics product portfolio, version 6.1 for Synapse Information Systems is designed to run in a virtual environment. Carestream’s Vue RIS is a dual-certified EHR. It provides a complete EHR for radiology groups and a modular certification for hospitals to connect with their EHR. 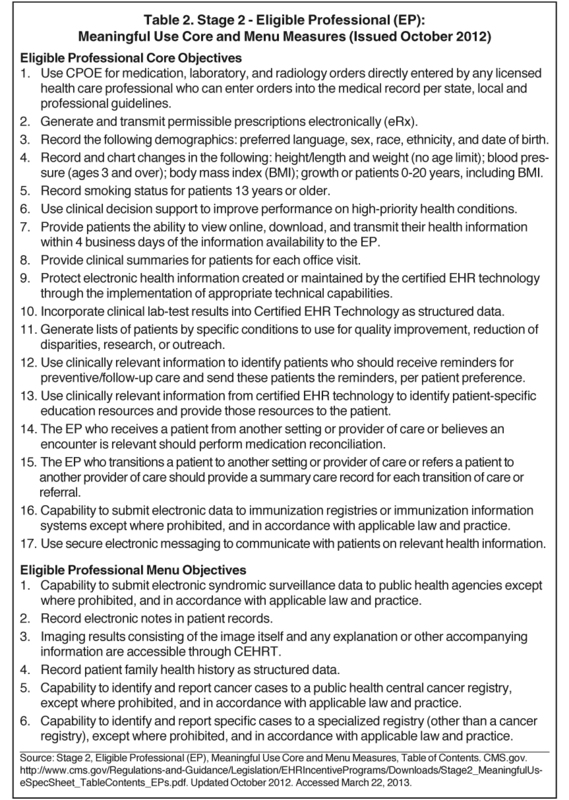 The complete EHR certification means that imaging centers, radiologists, orthopedists, and other EPs with Vue RIS do not need to purchase an EHR to capture and report data required to satisfy Stage 1 rules, such as an active patient medication list and ambulatory clinical quality measures. “Our RIS tracks and displays dose history by capturing exposure information from the modality. In the future, we will be able to allow physicists at user sites to enter formulas that can be used to calculate dose and ultimately track cumulative dose for each patient,” said Cristine Kao, Carestream’s Global Marketing Manager for Healthcare Information Solutions. Vue RIS provides embedded voice recognition, critical results reporting, centralized patient scheduling, and management reports that track patient referrals by physician and modality reading by each radiologist. With a dual-certified EHR, one product could drive both hospital and ambulatory requirements, depending on the scenario. “Hospitals that own an outpatient-imaging center could capture and send the eligible hospital data directly into their certified hospital EHR or submit the data directly to the CMS from Vue RIS to comply with the hospital eligibility requirements, while also using the same RIS solution. This would drive their ambulatory radiology practice and collect the incentive money available for the radiologists as EPs in the outpatient setting,” said Rufer. Other available modules include the Intelerad Meaningful Use Module 2012 by the Intelerad Medical Systems, which is also capable of supporting providers in meeting Stage 1 meaningful use measures. A modular certified product is designed to work in concert with other certified technologies to meet all the required measures for meaningful use. RIS can enable certain radiologists to meet meaningful use requirements by operating as a modular EHR. Agfa HealthCare’s IMPAX RIS/PACS, offering extensive integration with EHRs and other medical record solutions, can aid providers in meeting meaningful use requirements. Part of Agfa HealthCare’s RIS/PACS product is Impax Business Intelligence, which monitors clinical data against thresholds outlined in Stage 1 and reporting them through the IMPAX RIS solution. Facilities can select to monitor demographic data on patients with individual monitoring on patient-preferred language, gender, race, ethnicity, and date of birth; record vital signs on patients with individual monitoring on patients between the ages of 2 to 20 for height, weight, blood pressure, and body mass index (BMI); plot growth charts for patients between the ages of 2 to 20 for both height and weight against national statistics; and lastly, record smoking status on patients age 13 and older. 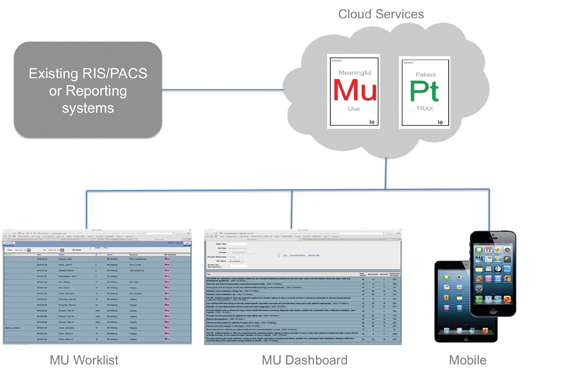 This can be used as a reporting dashboard in conjunction with certified technology. Siemens Healthcare recently introduced a new cloud-based option for its RIS, which is called syngoWorkflow (Figure 2). syngoWorkflow can be configured to directly capture meaningful use data (via data entry screen), receive (via interface), store, and transmit text-based patient information related to the procedure including, but not limited to, demographics, medications, allergies, and diagnostic reports. This solution can aid in attesting when used in conjunction with certified technology. GE Healthcare also released its Modular Certified meaningful use-ready software, Centricity Enterprise 6.9, a 2011/2012 compliant solution. When can radiology expect the next big wave of meaningful use compliance? Some say it will land when Stage 3 is implemented. “It is going to be based on the final outcome for Stage 3, specialty exclusions, overall adoption and continued funding for the program, plus whether there will be further stages to the program beyond Stage 3,” Rufer said. In the overall scheme of things, meaningful use is one more step toward a larger goal—health care reform—another reason why radiologists should consider today how to prepare for what’s coming tomorrow. More information on “meaningful use” core and menu measures and on the changes to the Stage 2 rule is available in the online edition of Technology Trends at appliedradiology.com. Mosquera M. CMS: Meaningful use EHR incentives hit $12.3B in February. Government Health IT. http://www.govhealthit.com/news/cms-meaningful-use-ehr-incentives-hit-123b-february. Updated March 15, 2013. Accessed March 22, 2013. Meaningful use. Policy making, regulation and strategy. HealthIT.gov. http://www.healthit.gov/policy-researchers-implementers/meaningful-use. Accessed April 8, 2013. Meaningful Use. CMS.gov. The Center for Medicare & Medicaid Services. Updated September 20, 2012. Accessed March 22, 2013. Stage 2 Overview Tipsheet. RSNA. http://www.cms.gov/Regulations-and-Guidance/Legislation/EHRIncentivePrograms/Downloads/Stage2Overview_Tipsheet.pdf. Updated August 2012. Accessed March 25, 2013. 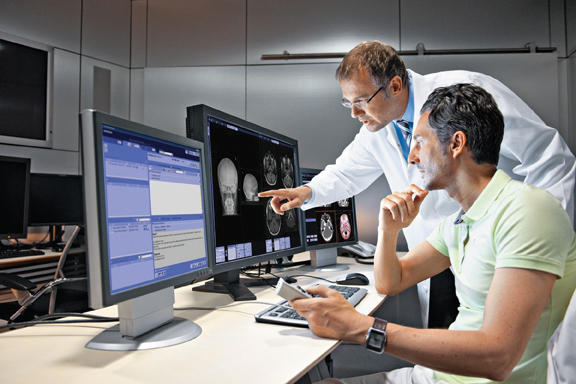 Experts urge radiology to embrace meaningful use now. Daily Bulletin. RSNA 2012. http://db2012.rsna.org/index.cfm?pg=12mon05. Updated November 26, 2012. Accessed March 25, 2013. Certified EHR Technology. CMS.gov. The Center for Medicare & Medicaid Services. Updated February 12, 2012. Accessed March 22, 2013. Collecting ‘Meaningful Use’ dollars. Appl Radiol.